Buy 6-11 Brightwell Aquatics products and receive a 5% discount. mineral secreted by reef-building organisms as skeletal material. 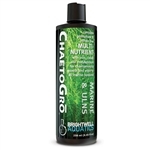 Brightwell Aquatics ChaetoGro is a complete phosphate and nitrate free multi-nutrient with iron, cobalt and molybdenum for chaetomorpha growth and vigor in all marine systems. resulting in improved water clarity (particularly in aquaria with heavy bioloads).